↑ Wycliffe Bible Encyclopedia, "saint", ISBN 0-8024-9697-0, "Christians in general are 'saints' in NT usage, and the term is common in reference to the inclusive membership of a local church . . . Other references in the NT equate Christians in general with 'saints' . 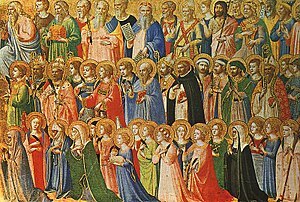 . . All these are identified as saints because they are in Christ Jesus."